Yup, you can actually celebrate your little one’s birthday at a real fire station, with real firefighters! Your little ones will have the time of their lives, well as soon as all the kids have gone through a compulsory safety drill. From having water fights with fire hoses to riding in a firetruck with all the lights flashing, this would make one unforgettable birthday party. There is no charge for the venue or the tours, but you will have to bring your own cake and decorations. Since this is such a cool party venue, it gets booked up quite fast so you may need to plan in advance. The best way to get in touch with them is by phone, so give them a buzz on 04 705 2770. Cost: Free, for up to 100 kids. 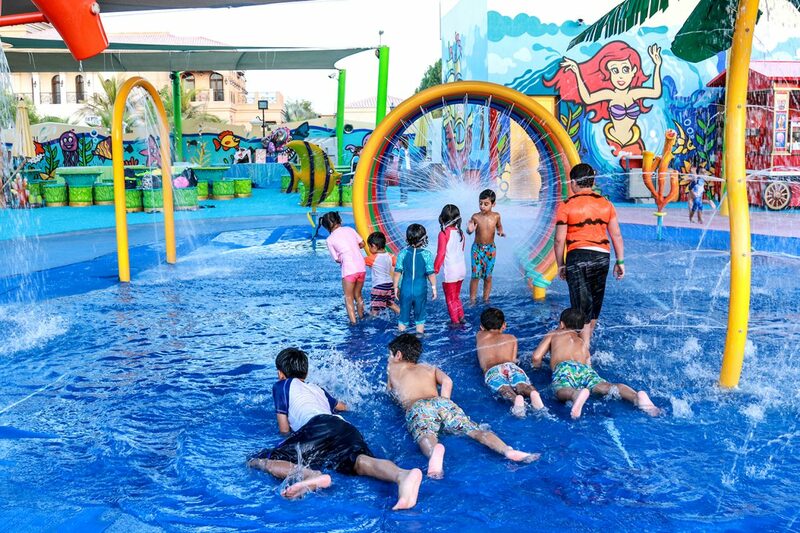 There’s a waterpark hidden in the middle of Umm Suqueim, and it’s dedicated to kids! Splash N Party has a restaurant and juice bar for parents to chill at, while their kiddies have a blast on the splash pads and water slides. Wat-er great way to celebrate a birthday! There is a minimum requirement of 15 kids for birthday packages, which includes food and access to the park. They also provide cakes, but you may bring your own if you prefer. Cost: AED 99 per child on weekdays, AED 120 on weekends, for 1 hour 45 mins. Perfect for all the mini Monets, Café Céramique Dubai lets the little ones get creative by painting their own little pottery piece to take home (ten days later). The fun doesn’t end there, the two-hour party also includes sand art, face painting, games, dancing, singing and loads of delicious food. There’s a minimum of 15 kids, and is open to ages 5 and up. Cost: Packages start at AED 70 per child, inclusive of food and drinks. Did you know that VOX has it’s own kids cinema? If you’re trying to avoid kids running around and wreaking havoc, VOX Kids is probably your best option for kids birthday party venues. The cinema screens all of the latest kid-friendly films in a fun colourful-themed cinema. Just pick your film, date and time, and ping an email over to events@maf.co.ae. Cost: Prices vary depending on number of guests, timing and location. Whether or not they know how to ski, the kids will truly love this! Ski Dubai has different activities available for different age groups – 2 years and up can access the Snow Park (with the giant zorb balls), 3 years and up can book a Ski Discovery lesson, and 8 years and up can book a Snowboard Discovery lesson, all while you enjoy a cup of hot chocolate. For birthday bookings, there’s a minimum of 10 kids, and maximum of 25. Looking for something that will tire the kids out, so they have no more energy left to run around and drive you insane? Great – Bounce Dubai it is. Parents, you can sit back and relax in a reserved area, while the little monsters jump around non-stop on the trampolines, party in a private room, take pictures, win prizes and more. There’s a minimum requirement of 10 bouncers to book. Food and drinks are included, and you can even upgrade to get fresh Freedom Pizzas! Cost: From AED 130 per child, for 1 hour 45 mins – depending on party size. There is soooo much to do at Adventure Zone, your little one and his/her friends will not want to leave. You will have different packages to choose from, but on top of the jumping, swinging, bouldering and zip-lining, Adventure Zone will decorate the entire space, provide you with a ballon twister, pinata and more! Minimum 12 kids for the party package, and the 13th kid enters free! Cost: AED 140 per person on weekdays, AED 170 on weekends. Looking for something a little different? Check out these 5 nighttime experiences for the whole family, or if you’re little one is a huge foodie, here are some top restaurants where kids dine for free!